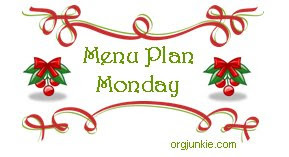 In an effort to get my meal planning straight, I'm participating in Menu Plan Monday, hosted each week by I'm An Organizing Junkie. Check out the site - it's pretty informative and a great resource! The salmon recipe sounds delish. Mr. Gooch and I are always looking for new ways to make salmon. Don't forget to post the recipe. Can I come over for dinner on Sunday? Roasted lemon chicken with olives and capers sounds divine! I used to be so good at planning our menus out ahead of time. I need to get back to doing that. It saved so much time and money. Everything sounds delicious! The new blog looks great! I love MPM. I don't participate as often as I should but it really did make things easier -- at least on those weeks where my life wasn't crazy busy.Everything looks delish.